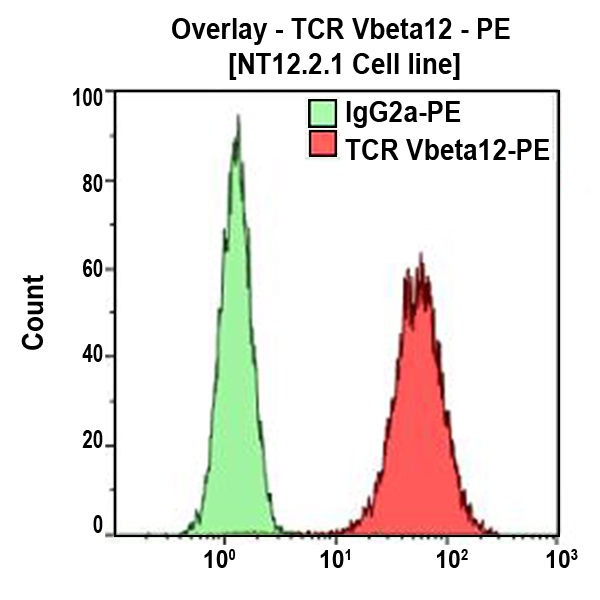 Also called TCRBV12S1 Vβ12 is a family of the T cell receptor. It is expressed by 1.1% to 1.9% of peripheral CD3+ cells in normal blood. This sequence is also referred to as TRBV10-3 (based on the IMGT gene nomenclature). Clone Description The VER2.32.1 monoclonal antibody recognizes HBP54 identical to PH27 sequence often referred to as VB12.2. The reactivity of the other members of this family (PL4.2 sequence) and other recently described VB12 genes (HT96 sequence) has not been found but cannot be formally excluded.